Arthur Miller was born in New York City on October 17, 1915. His father, Isadore Miller, was prosperous as a shop owner and a manufacturer of women's coats; however, he lost his fortune in the stock market crash of 1929. The young Miller was forced to work a number of odd jobs to support himself, including being a farm hand. The years after the Depression were formative years for Miller, during which the formerly indifferent student began reading on his own and developing a strong social conscience and sense of justice. He eventually entered the University of Michigan, where he began writing plays and worked on the college newspaper. After graduating in 1938, he moved back to New York, where he continued writing, primarily dramas. Arthur Miller's plays met with great success. The Man Who Had All the Luck, produced in 1944, won a prize offered by New York City's Theatre Guild. His first major success, however, came in 1947 with All My Sons, which won a Drama Critics Circle Award and was made into a film the following year. Death of a Salesman, Miller's most famous work produced in 1949, won a Pulitzer Prize and was made into a film in 1952. Death of a Salesman casts a cold eye on the American Dream and the moral compromises necessary to achieve it. Its hero, the hapless salesman Willy Loman, is a man struggling to make sense of his place in a society that has chewed him up and is preparing to spit him out. The Crucible, a Tony Award winning play produced in 1953, is one of Miller's finest works, which also shows the playwright's strong social conscience. Set during the Salem witch trials at the end of the 17th century, it is written as a critique of the extremes and evils of McCarthyism. The play offers a vision of a society consumed by paranoia, in which the age-old problem of doing good in the face of evil becomes a matter of life and death. Miller's political activities in the 1950's led him to be called before the House Un-American Activities Committee in 1956. Like Proctor, the protagonist of The Crucible, he refused to testify against his friends and associates. He was convicted of contempt, but this ruling was later overturned on appeal. After the investigation, Miller continued to be politically active. In 1965, he was elected president of PEN, an international organization of writers dedicated toward world peace and free expression. Miller has been married three times. He married Mary Grace Slattery in 1940. They had two children, Robert and Jane, before their divorce in 1955. Miller next married Marilyn Monroe in 1956. They were divorced in 1961, following the filming of The Misfits, for which he wrote the screenplay and in which she starred. In 1962 he married the photographer Inge Morath. They have one child, Rebecca Miller, who is an actress. Miller's works are known for their strong commitment to social justice, their concern for the ordinary person, and their intricate explorations of the inner lives of their characters. 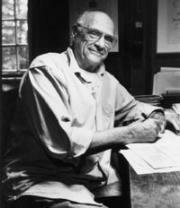 Other plays by Miller include A View from the Bridge (1955), After the Fall (1964), Incident at Vichy (1964), The Price (1968), The American Clock (1980), and The Last Yankee (1993). He has also written several travel narratives and a novel. His autobiography, Timebends: A Life, was published in 1987. Miller continues to be active in the arts and to receive accolades. He won a Kennedy Center award for lifetime achievement in the arts in 1984, and in 1993 he received the National Medal of the Arts from President Clinton. Broken Glass, published in 1994 and written for his late father, received the 1995 Oliver award.